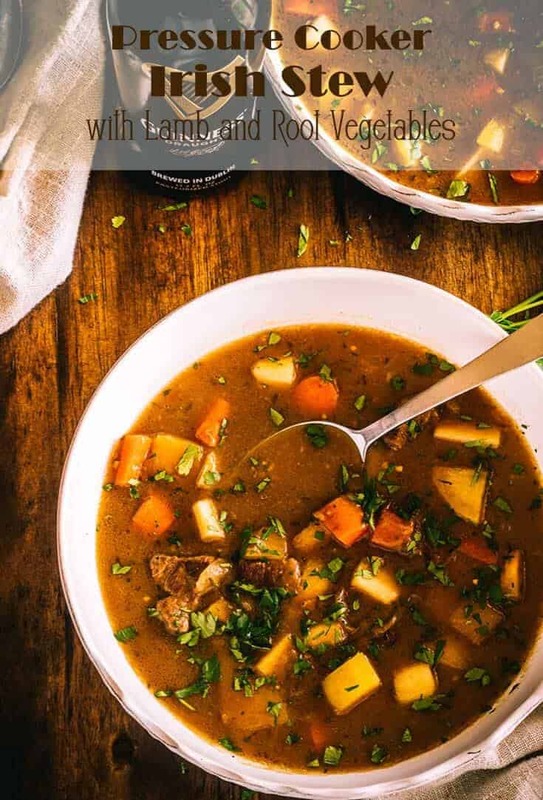 Tender lamb cubes with earthy root vegetables in a savory stew flavored with herbs and (of course) stout… Pressure Cooker Irish Stew is a great option for St. Patrick’s Day, but I’ll bet the “luck of the Irish” you’ll love it any day! It’s still technically “winter” in many parts of the World, right? With the exception of 1 really hot day, even the Rio Grande Valley has been temperate. 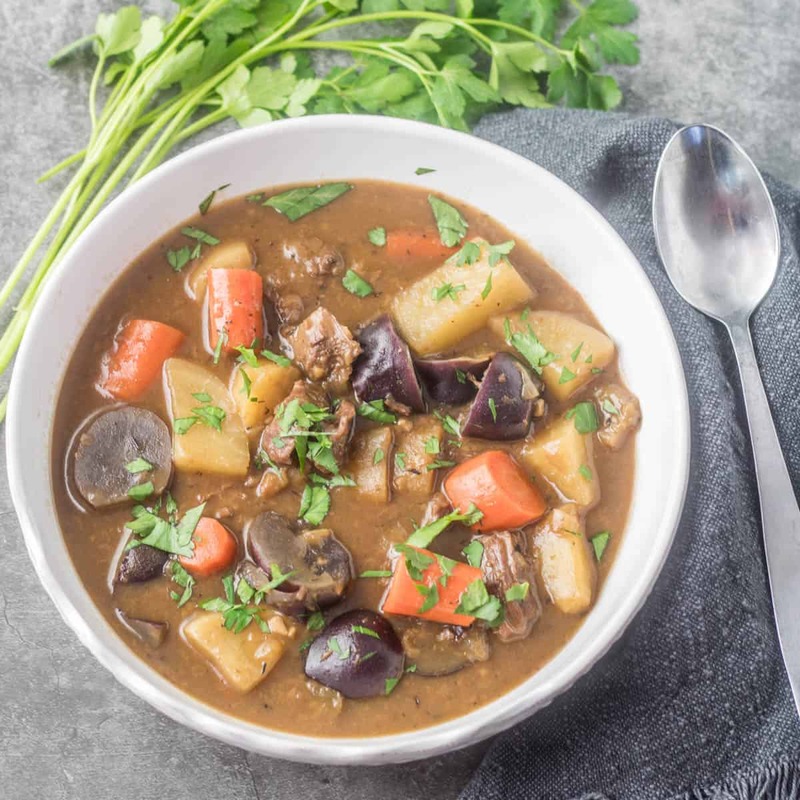 In considering my March posting schedule, Irish stew seemed appropriate, but admittedly it’s hard to get “in the mood” when it’s 101 degrees outside. It was a hot one… on February 23! That’s when I decided to work on this recipe. Whew! Fortunately, that day was an anomaly. We’re back in the seventies and eighties for the time being. So, I digress. With the popularity of Instant Pot, I am finding loads of interest in pressure cooker recipes. First, for the record, I don’t own one. I have been cooking with a pressure cooker since the “olden days” when I was a teenager and was fascinated by my mom’s dangerous electric model. I love pressure cooker cooking – in most cases the results are superior to slow cooking. That will be a post for another day… I went shopping. I toyed with the idea of buying an Instant Pot because they’re “hot” right now. After doing some research, I settled on a Pressure Cooker XL. At the time, the difference in price was substantial, and the reviews for both were solid. I saved about 20%, and the features are very similar. I highly recommend either brand. I have also purchased stove top pressure cookers for 2 of our 4 sons, and they do quite well with them. In any case, the days of exploding pressure cookers are behind us. All models have built-in safety features, and you can feel confident in using one. Trust me. Beer. Specifically stout. Disclaimer: I don’t love Guinness Stout. I am a dark beer girl, and Guinness is a bit “one note” for my taste. However, it works well in this recipe, and it is widely available. Feel free to substitute another stout, but stay away from a sweet stout like a milk or chocolate stout. Do not worry about the alcohol. It will dissipate, leaving the flavor of the beer. Do not use a hoppy beer, as it will result in a bitter stew. Porter or another dark, malty beer should work just fine. I complete this Pressure Cooker Irish Stew in two steps. I want tender meat, and tender vegetables. I do not want mushy vegetables. After experimenting a few times, I found that cooking the meat in the liquid for 30 minutes, de-pressurizing, adding the root vegetables, and then cooking another 10 minutes is about right. I do a 10 minute natural pressure release and then release the remaining pressure both times. My preference for this stew is lamb, though beef is very tasty as well. A very traditional Irish stew uses mutton, and I’ve never found it, and certainly not cooked with it. If you’re the adventuresome sort, and you find mutton, go for it! Potatoes are really the most common root vegetable in a traditional Irish stew. I like to mix it up. I use about 5 cups of cubed root vegetables, and include potatoes, carrots, rutabaga, and parsnips. These flavors work well together, and add complexity to the dish. The parsnips and carrots balance the hint of bitterness from the rutabaga and the beer. Rutabaga tastes (and looks) a bit like a turnip. Turnips would be a nice choice as well. If you adore sweet potatoes, they’ll work… Limit your vegetables to roots, though. Do you typically prepare a special meal for St. Patrick’s Day? If so, what would that be? I’d love to hear your food stories! If this pressure cooker recipe isn’t quite what you had in mind, check out my Pressure Cooker Lamb Stew Provençal, or my Instant Pot Korean Chicken Thighs – two of my most popular recipes. I think you will find it’s hard to beat the tender results achieved in a relatively short time in the pressure cooker. 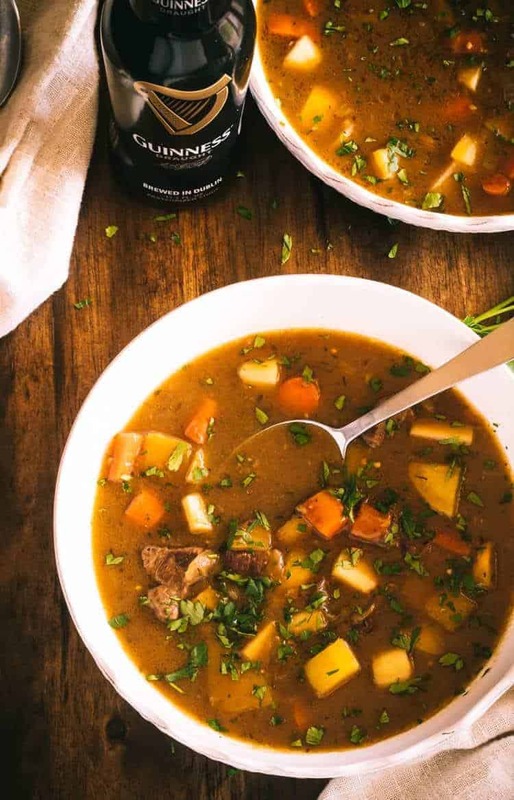 Tender lamb cubes with earthy root vegetables in a savory stew flavored with herbs and (of course) stout... Pressure Cooker Irish Stew is a great option for St. Patrick's Day, but I'll bet the "luck of the Irish" you'll love it any day! If you're using an electric appliance, select "stew" setting on "well" for 30 minutes. If using a stove top model, heat over medium-high heat. Add the olive oil, and when it is hot, add the cubed meat. Brown the meat, then add the onion and garlic. Stir an additional few minutes until they begin to soften. Add the flour. Stir the flour into the meat mixture for 3-4 minutes to give it a chance to begin browning. Add the thyme, bay, beer and broth or stock. Allow the cooker to release pressure naturally for 10 minutes, then do a quick release of the remaining pressure. Open, and add the root vegetables. Lock and set for 10 minutes (or 10 minutes on the stove). Do a quick release. Season with salt and pepper to taste. Garnish with flat leaf parsley if desired. We prefer lamb, but beef is a delicious option as well. I've used bone-in and boneless, and always go back to boneless to keep it simple. As I mentioned in the post, I use a combination of root vegetables including potatoes, carrots, rutabagas, and parsnips. Use your favorites. Macronutrients (approximation from MyFitnessPal): 485 calories; 30 g protein; 44 g carbohydrates; 18 g fat. You know when you go to the grocery store and there's a great deal on something that you just CAN'T pass up? Do you also know how you put things in your freezer to use later, then forget about them? Well, I found a couple individually packaged, decent quality, rib-eye steaks that had spent far too much time in the tundra of my freezer. they likely wouldn't be great to eat as steaks anymore. So... what to do? Well, I made a couple substitutions/ad-libs. I cubed the two aforementioned ruined rib-eyes. I went to the grocery store and picked up two carrots, a Yukon gold potato, and a parsnip (which ended up being more vegetable than the recipe called for, but I cooked it anyway). It was cold outside, so I grabbed one of my go-to beer choices, Santa Fe Brewing Company's State Pen Porter, because that's what I wanted to drink. This stew was the best thing I could have made that night, and cost me $9 and less effort than getting the car warmed for work that morning. That is so cool! Way to save freezer food! I get so frustrated with the stuff that ends up freezer burned in the bottom... Great choice, and thanks for writing Devin! I'm glad you enjoyed it Evan! I would have to agree!